Chris Jordan photographs the overflow of consumer culture as panoramic portraits of steel drums, piles of crushed cars, sawdust, mountains of cell phone chargers, shipping containers, gas cylinders… production and its waste are not without beauty. The Bible supports environmentally sound thinking, so the first step in encouraging pro-environment Christianity is dismantling the James Watt-derived notion that Jesus would actually want us to milk dry the earth (“After the last tree is felled, Christ will come back”). [Update: A commenter points out that this widely-circulated quote was not actually made by James Watt, but attributed to him by Grist.] There are still many Christians who believe that Rapture is imminent, and that there is therefore no need to take care of the earth. Nice piece at AlterNet on the greening of the Christian Right. Conservative evangelical Christians are getting worried about the fate of God’s creation. Can the greening of the GOP base happen fast enough to derail the party’s scorched-earth plans for Bush II? Despite the efforts of old-guard religious conservatives like Carter to squash the growing Christian environmental movement, many national Christian groups, such as the National Association of Evangelicals, are working to teach churches that you don’t have to sleep with hippies to care about your world. The memes are slowly changing. Last week, cleaning up after a catered event at work, noticed that people were throwing away some large, very solid, easily-reusable serving platters. I asked, “Doesn’t the catering company want them back? Shouldn’t we save them?” Response: “Nahhh…” And that was it. I said something about landfills, and the janitor rolled his eyes at me, looking for confirmation from another person in the room that I was, indeed, crazy. This week, a team of 1,300 scientists has released the most comprehensive analysis ever conducted of how the world’s oceans, dry lands, forests and species interact and depend on one another. Many of the world’s ecosystems are in danger and might not support future generations unless radical measures are implemented to protect and revive them. 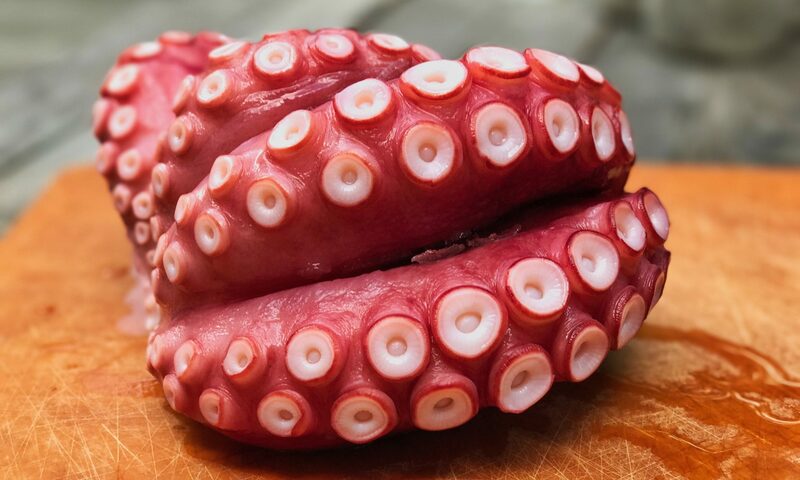 The five-year study, commissioned by the United Nations and a number of businesses and independent groups, arrived at a mixed prognosis for planet Earth: Its deteriorating environmental health still is treatable, but only with aggressive and expensive corrective measures. In the 219-page report, scientists looked at 24 different “services” the Earth’s ecosystem provided people and found that 15 of them are in trouble. … “Human actions are depleting Earth’s natural capital, putting such strain on the environment that the ability of the planet’s ecosystems to sustain future generations can no longer be taken for granted,” the authors said. And still, the merest suggestion of care causes half of America to roll its collective eyeballs. What’s wrong with this picture? Hint: It’s not the loafers on our mystery model. 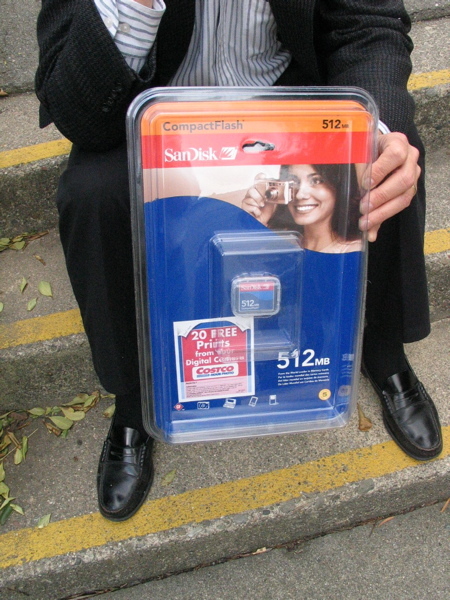 Size of CompactFlash card: 1.5″ square x .25″ thick. Surface area of impenetrable plastic container: Unaccountably vast. Not to put too fine a point on it, but this kind of packaging waste makes me feel ill. Clearly it serves no purpose other than to make the product stand out on the shelf. SanDisk marketing droids, listen up: If I see your product on the shelf alongside a similar product in less wasteful packaging, I will choose your competitor’s product, even if I have to pay a bit more for it — just to send a message. And don’t even get me started on the difficulty of opening this kind of container, which has become inexplicably ubiquitous. Seriously, it’s a mystery – how can this much technology go into making the package “pretty,” so little thought go towards even the slightest shred of environmental awareness, and so little concern be granted the poor consumer who has to figure out how to open the damn thing? I just don’t get it. I feel like Andy Rooney. Tectonic shift? Probably not, but it occurred to me recently that there was a sort of cultural/political musical chairs going on. Pro-nuke Greens! Pro-environment Christians! On one hand, a growing cadre of pro-nuclear Greens — a notion* that would have seemed unthinkable a decade ago. On the other, an apparently growing swath of pro-environment Christians. This makes so much sense to me – without being a Biblical scholar, I’ve always thought that the teachings of Christ pointed in important ways to environmental sensitivity; so the preponderant alignment of Christians with the profoundly anti-environment Bush administration has always seemed unsettling. It does make you wonder: What Would Jesus Drive? OK, not a tectonic shift, but evidence that religious and political generalizations are always bound to fail… and to surprise. * I swore I’d never use the word “notion” here, but there you have it. Some of the world’s most thoughtful greens have discovered the logic of nuclear power, including Gaia theorist James Lovelock, Greenpeace cofounder Patrick Moore, and Britain’s Bishop Hugh Montefiore, a longtime board member of Friends of the Earth. The “green” arguments in favor of nuclear power are not airtight, but the Wired piece does make a pretty compelling case. Not because nuclear power has become as safe as solar or wind, but because the current hydrocarbon-based situation is so dire. Burning hydrocarbons is a luxury that a planet with 6 billion energy-hungry souls can’t afford. There’s only one sane, practical alternative: nuclear power. So, yes — if we had put all of the effort and funding over the years into solar that we’ve put into nukes, solar power generation today would be cheaper and more efficient than it is. But I somehow don’t think we would have put that much of a dent in the space requirement problem. I think I’d be willing to reconsider my stance on nuclear power if we had adequate answers to long-term waste storage problems. Unfortunately, the article pretty much glosses those, focusing instead on the possibilities of recycling spent fuel (which are promising). But until the storage problem is really nailed, there is a problem of conscience. We call the ancient Egyptians “ancient” and they were doing their thing just 5,000 years ago. 100,000 years+ is an almost inconceivably long period of time. It is almost impossible to image us not coming up with a good storage answer somewhere in that span. But it is also unconscionable to start laying this stuff in the ground before we’ve figured it out. It’s our problem, not our childrens’. Before the election, I made a plea to prioritize care for the environment (take the long view) over the war in Iraq when casting votes. Now the war in Iraq is (maybe) winding down, while environmental issues that will affect us all in much more profound ways seem to be biting us back (again). Two stories in the Chronicle today left me feeling bewildered and very, very sad. First, a story about how the EPA has been cooking the books for the Bush administration to meet business-friendly goals. According to EPA insiders, science took a back seat to politics in the creation of the report, and the agency whose responsibility it is to protect the environment became a puppet of the administration. That story was buried on page A11. 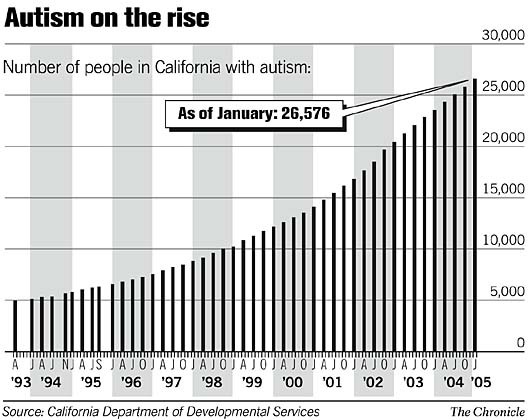 The second story, which made front page, is about the shocking rise of autism in California (actually nation-wide, but the story is mostly about CA). “The number of autistic people getting services at the centers has increased from 5,000 in 1993 to more than 26,000 now.” (see graphic). And researchers are baffled. Part of the rise can be explained by increased awareness of autism, but the increase is far too drastic to be accounted for via awareness alone. Early childhood vaccinations are not ruled out (but see below). No one can prove anything, and yet someone must. Because the rise is generalized to a huge geographical region, explanations will have to be either environmental or social (e.g. too much TV rots your brain). On the other hand, the article does point out that dropping the mercury-based preservative Themerisol from children’s vaccinations does not seem to have had any impact on autism rates. So maybe there’s no linkage between mercury in the environment and the rise of autism. But something in the environment is causing it. And the official stewards of our environment are puppets of big business. I’m not making a direct causal connection between these two stories. I am making a connection between the awesome (and, I would argue, common sense) responsibility to maintain the health of our only human home and the ultimate consequences of failing to do so. SF Chronicle: With 5,000 windmills in a 50-square-mile area, the Altamont Pass is the world’s largest wind farm, producing enough electricity to power 200,000 households annually. But it is also the worst in the country for slaughtering birds. Environmentalists are not stuck in limbo on wind energy though. Installations like Altamont have become both proving grounds and object lessons for one of the cleanest, most renewable energy technologies we have. Newer towers are much taller, with much larger turbines, both factors that greatly reduce bird deaths by making themselves more visible while spinning, and by spinning above the altitude where predatory birds fly. And, according to the Chronicle piece, we’ve learned that placing the turbines on the leeward side of mountains, we remove them from the paths favored by birds. A month ago, I was talking to someone I know well — a family member — about the election. He said he was split in his thinking on some of the major planks of Democratic and Republican platforms – for example, he considered himself to be pro-environment. But he has decided to vote for Bush in the coming election. Throughout this election cycle, discussion of the war in the Iraq has all but eclipsed discussion of the environment. When you take the long view, the state of our air and water will have a broader- and deeper-reaching effect on the world we live in (and the world our children live in) than the war in Iraq, than Social Security, than outsourcing questions, than whether a few more or a few less taxes will improve or diminish our overall standard of living. Many changes to the environment are irreversible, or at least extremely difficult to reverse. And, forgive me for speaking in cliche’s, but this is as true today as it was on the first Earth Day — until we find a workable replacement planet and master high-speed interstellar travel, we only have one earth. And we are its stewards. No one will take care of it, or clean up our messes, but us. I don’t think we should shut down all industry and turn America into an agrarian commune. But I do think we need to weigh every action and every industry against its long-term environmental impact. Because after this Iraq thing blows over, after we do or do not fix the health care system, after we do or do not hand out a few more dollars in tax cuts for the rich, we will still be living in our own cesspool, breathing and eating and drinking our own effluent. Maybe people think talking about the environment is boring, or no longer relevant, or that we’ve made “great strides.” News flash: Our environmental problems have not gone away. Environmental crises are so large, so deeply enmeshed in our world and in our lifestyle, that most people have forgotten how to see them. Smaller concerns fill our heads and our front pages, while species disappear, as forests vanish, record numbers of beaches close, asthma rates skyrocket, coral reefs are decimated, mercury levels balloon, the Union of Concerned Scientists say global warming is real (and caused by humans) and on and on. What does all of this have to do with the coming election? Simply put, George W. Bush not only has the worst environmental record of any president we’ve ever had, but he has actively worked against environmental protections in favor of profit for industry. And that, I believe, has greater ramifications for humanity than Iraq or any other issue that has consumed this campaign cycle. If there is any doubt whatsoever in your mind about whom to vote for, just forget everything else for a moment — Bush’s environmental record alone is reason enough to remove him from office. I’m going to quote at length from a recent interview with Robert F. Kennedy, talking to Mother Jones about Bush’s environmental record. Under [Bush’s] leadership, Texas became the most polluted state in the country, with the highest levels of air pollution, the highest levels of water pollution, and the highest level of toxic waste and toxic releases. And it was 49th among 50 states in per-capita environmental spending. The Bush administration consistently favored corporate interests over the environment and public health, assaulting the very idea of a common good. … the right wing, who claim to be on the side of property rights, but really only favor property rights when they’re talking about the right of a polluter to use his property to destroy his neighbor’s property or the public property. He did it on the campaign trail by simply saying that he was going to support initiatives to control global warming. But once he got into office, he immediately reversed that and abandoned that promise, and began dismantling our environmental infrastructure. When they want to destroy the forests, they call it the Healthy Forest Act; when they want to destroy the air, they call it the Clear Skies bill. The head of the air division of the EPA was Marianne Horinko, whose former job had been advising corporate polluters on how to evade Superfund. The second in command of EPA was a Monsanto lobbyist. If you look at virtually all of the sub-secretariats and agency heads in the Departments of Agriculture, Energy and Interior and EPA, the same pattern holds. Polluters have been put in charge of the agencies that are supposed to protect Americans from pollution. … one out of every four black kids in New York City now has asthma. Asthma attacks are triggered primarily by ozone and particulates, and the major sources of those materials in our atmosphere are 1,100 coal-burning power plants that are burning coal illegally. The Clinton administration had initiated investigations and prosecutions against 70 of the worst of those. But this is an industry that donated $48 million to President Bush and the Republican Party in the 2000 cycle and has given $58 million since. One of the first things that Bush did when he came into office was to order the Justice Department to drop those lawsuits. The Clinton administration had classified mercury as a hazardous pollutant under the Clean Air Act, which triggered a requirement that those utilities remove 90 percent of the mercury within three and a half years. It would have cost less than 1 percent of plant revenue, and the great thing about it is that it works; we now know that when the utilities stop discharging mercury, that the fish downstream clean up almost immediately. … But this is an industry that gave all that money, over $100 million, to the president. A few months ago, the Bush administration announced that it was scrapping the Clinton-era regulations and substituting instead regulations that were written by utility lawyers, from the law firm of Latham and Watkins. Under the new rules, the utilities will effectively never have to clean up their mercury. At this point, Congress is controlled by anti-environmental Republicans like Tom DeLay. Tom DeLay is a former Houston bug killer who entered politics because he was angry that his extermination business had been impacted by the ban on DDT and other pesticides, and he’s out to destroy America’s environmental laws. What [Bush has] done already would have been unimaginable five years ago. He is the number-one threat to the global environment. And the disastrous impacts of this administration don’t just go to the environment, but also to our democracy. The U.S. has fallen behind other nations in development of solar power, sacrificing tremendous potential revenue opportunities while simultaneously cultivating continued dependence on foreign and domestic oil sources (remember that Bush has a lot of buddies in the oil industry). Read much, much more at BushGreenWatch, Mother Jones’ special report The Ungreening of America, Common Dreams… or hell, just google it. This election cycle, please take the long view. Update: Even as I write, today’s papers underline the point. In the Chronicle, Bush would give dam owners special access (Proposed Interior Dept. rule could mean millions for industry). And at Contra Costa Times, Arnold Schwarzenegger dropped from the environmental honor roll, scoring a 58 out of 100 — more than most Republicans, but far below the 100/100 Gray Davis scored in 2003.